Nothing beats a great Scandinavian crime novel in the chilly winter months, and this winter is brimming with fantastic Nordic Noir for you to devour. Whether you’re a fan of paperbacks or hardcovers, series installments or standalones, there’s a Nordic crime novel for you releasing this winter—and you’ll find my personal picks for highly-anticipated early 2019 releases right here! In this post, I’m rounding up the most exciting Scandinavian crime fiction releasing from January 2019 through March 2019. Some of these titles are paperback releases of hardcovers I’ve already read (and loved! ), some are brand-new hardcovers that I haven’t even read yet—but they’re all highly-anticipated releases that I’m so excited to share with you! If you’re looking for a new Nordic Noir release (or two!) to devour this winter, look no further: your early 2019 Nordic Noir reading list is right here. Note: a couple of the books included in this post are only slated for release in the UK at the moment; those books are labeled “UK Release.” All other books are US releases. This post contains Amazon Affiliate links. Crime by the Book is a participant in the Amazon Services LLC Associates Program, an affiliate advertising program designed to provide a means for sites to earn advertising fees by advertising and linking to Amazon.com. This in no way affects my opinion of the books included in this post. Why I’m Excited: THE SANDMAN was one of my favorite books of 2018, and I’m so excited to get my hands on its gorgeous paperback edition! If you haven’t yet checked out Lars Kepler’s brilliant Joona Linna series, this will make a perfect place to start. It’s Book 4 in the series, but can easily be read as a standalone—or as your entree into this gripping series. On top of its stellar pacing and plot, THE SANDMAN features one of the most memorable - and terrifying - villains in recent memory: a character so bone-chilling that Lee Child himself compared him to Hannibal Lecter. Plot Details: The #1 internationally best-selling thriller from the author of The Hypnotist tells the chilling story of a manipulative serial killer and the two brilliant police agents who must try to beat him at his own game. Why I’m Excited: I managed to read a bit of this new Scandinavian thriller a few months ago, and I simply can’t wait to get my hands on a finished copy and see where the story goes! Sveistrup is best known as the writer behind the hugely popular TV show The Killing, and he brings to THE CHESTNUT MAN a certain page-turning plotting and engaging dialogue that reads like it’s made for TV, in the best way. Plot Details: One blustery October morning in a quiet Copenhagen suburb, the police make a terrible discovery. A young woman is found brutally murdered with one of her hands missing. Above her hangs a small doll made of chestnuts. Note: THE CHESTNUT MAN can be ordered from the UK via BookDepository here, or you can pre-order it on Amazon in the US (link below! ), where it will be released in the fall of 2019. 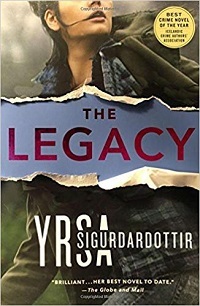 Why I’m Excited: Known for her dark, twisted plots, Yrsa Sigurdardottir lives up to her reputation in THE LEGACY. I absolutely loved this book when it released in hardcover last year, and am so excited that it’s now available in paperback! THE LEGACY is Book 1 in Yrsa’s new Children’s House series; Book 2, THE RECKONING, releases in February, making this the perfect time to play catch-up. If you love layered, gritty police procedurals infused with some seriously gory touches, THE LEGACY will be right up your alley. Plot Details: The first in a stunning new series from Yrsa Sigurdardottir, the author of The Silence of the Sea, winner of the 2015 Petrona Award for best Scandinavian Crime Novel. The Legacy is the first installment in a fantastic new Icelandic series featuring the psychologist Freyja and the police officer Huldar. Why I’m Excited: Jonasson’s Dark Iceland series is one of my personal Nordic Noir favorites, and this week, the fourth book in the series releases in the U.S.! If you’re in the mood for an atmospheric mystery that feels very much inspired by classic crime, you will love the Dark Iceland books. Plot Details: Hailed for combining the darkness of Nordic Noir with classic mystery writing, author Ragnar Jonasson’s books are haunting, atmospheric, and complex. Rupture, the latest Ari Thór thriller, delivers another dark mystery that is chillingly stunning with its complexity and fluidity. Why I’m Excited: Kepler, the pseudonym for a husband & wife writing team, delivers an absolutely twisted - and gripping - serial killer thriller in STALKER. This book might be set in Scandinavia, but it leans away from the genre’s more typical slow-burning plot, and instead favors the action-packed, page-turning pacing of a thriller. There’s so much to love here, from the book’s richly developed protagonists and antagonists to its short chapters that make binge-reading easy. Plot Details: The internationally bestselling authors of The Sandman and The Hypnotist return with a terrifying new thriller: Detective Joona Linna--recently returned from compassionate leave--reunites with hypnotist Erik Maria Bark in a search for a seemingly unassailable sadistic killer. Why I’m Excited: Remember the second book in Yrsa’s Children’s House series that I mentioned earlier? This is it! 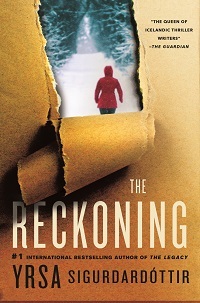 THE RECKONING is every bit a fantastic follow-up to THE LEGACY; this complex, masterful procedural delves into a disturbing case, and asks readers to consider what happens when those in positions of power ignore the needs of society’s most vulnerable members. It’s dark, gritty, and emotionally resonant. Plot Details: Vaka sits, regretting her choice of coat, on the cold steps of her new school. Her father appears to have forgotten to pick her up, her mother has forgotten to give her this week’s pocket money, and the school is already locked for the day. Grownups, she decides, are useless. Why I’m Excited: Grebe is the author of one of my favorite books, THE ICE BENEATH HER—so naturally, any new book from her is one I must read! AFTER SHE’S GONE is an exceptional book in its own right. This compelling suspense story delivers an engrossing mystery and some genuinely impactful pieces of social commentary, too—a balance that’s both thoroughly entertaining and timely. There’s something about Grebe’s writing I just love, and AFTER SHE’S GONE delivers. Plot Details: Out of the frozen depths of a forest in Ormberg, Sweden, a woman stumbles onto the road. Her arms are covered with scratches, her feet are bare, and she has no memory of who she is. Local police identify her as psychological profiler Hanne Lagerlind-Schön, who, with her partner, had been helping investigate the cold case of a young woman’s murder. Hanne begins to recover but cannot recall anything about where her partner is, or what their investigation had uncovered before her disappearance. Police have only one lead: a young woman in a sequined dress who was spotted nearby the night Hanne was found. Why I’m Excited: Helene Tursten has been a fixture of the Scandinavian crime genre for years now, but HUNTING GAME will provide readers with a fresh new opportunity to explore her work! This book launches a brand-new series for Tursten, and features a 28-year-old female lead and a “locked room mystery” style plot. Safe to say I am very excited about this one! Plot Details: The first installment in Helene Tursten's brand new series featuring the strong, smart Detective Inspector Embla Nyström. Twenty-eight-year-old Embla Nyström has been plagued by chronic nightmares and racing thoughts ever since she can remember. She has learned to channel most of her anxious energy into her position as Detective Inspector in the mobile unit in Gothenburg, Sweden, and into sports. A talented hunter and prizewinning Nordic welterweight, she is glad to be taking a vacation from her high-stress job to attend the annual moose hunt with her family and friends. But when Embla arrives at her uncle’s cabin in rural Dalsland, she sees an unfamiliar face has joined the group: Peter, enigmatic, attractive, and newly divorced. And she isn’t the only one to notice. One longtime member of the hunt doesn’t welcome the presence of an outsider and is quick to point out that with Peter, the group’s number reaches thirteen, a bad omen for the week. Sure enough, a string of unsettling incidents follow, culminating in the disappearance of two hunters. Embla takes charge of the search, and they soon find one of the missing men floating facedown in the nearby lake. With the help of local reinforcements, Embla delves into the dark pasts of her fellow hunters in search of a killer. Why I’m Excited: Blaedel’s Family Secrets trilogy puts a fresh new spin on Scandinavian crime writing. This series follows a Danish woman who leaves her home in Denmark to come to the United States and pursue the truth about her father, a man who abandoned his wife and child years prior. The first book in this series was all about laying the groundwork, and HER FATHER’S SECRET promises to increase the tension and chills. Plot Details: After suddenly inheriting a funeral home from her father--who she hadn't heard from in decades--Ilka Jensen has impulsively abandoned her quiet life in Denmark to visit the small town in rural Wisconsin where her father lived. There, she's devastated to discover her father's second family: a stepmother and two half sisters she never knew existed. And who aren't the least bit welcoming, despite Ilka's efforts to reach out. Why I’m Excited: I’ve actually already read THE SILVER ROAD, and what a stellar read it is. This book reads more like Winter’s Bone than it does like a typical Scandinavian crime novel. Set against the grit and sparsity of northern Sweden, THE SILVER ROAD is a story that feels universal in the small-town life and interpersonal dynamics it portrays. 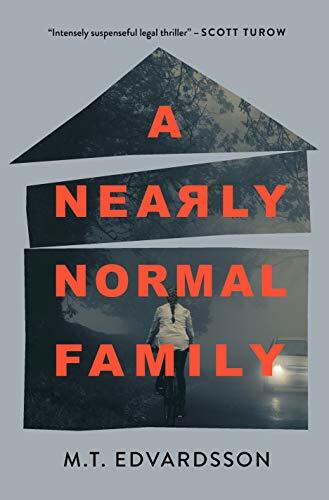 This slow burn of a suspense story is utterly immersive and atmospheric—a perfect choice if you want a book that will pick you up and drop you off in the middle of a town steeped in despair, and characters much the same. Plot Details: Three years ago, Lelle's daughter went missing in a remote part of Northern Sweden. Lelle has spent the intervening summers driving the Silver Road under the midnight sun, frantically searching for his lost daughter, for himself and for redemption. NOTE: If you’re based in the US, you can find this title on BookDepository here.